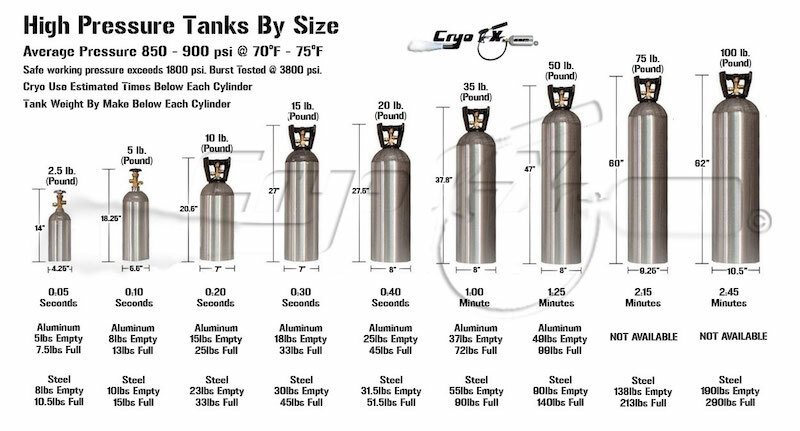 Here are the parts you need to purchase to create your own in-home seltzer dispenser, except for the actual co2 canister. I've linked to amazon for pricing and availability. I'm unsure where else you could buy everything, although I suspect any brewing supply store probably has everything you need (except possibly the soda bottle adapter). It turns out this regulator is kind of junky as I will explain later. If I were doing this again I would purchase a different regulator. I'll explain what is wrong with this regulator later on. If I wanted, I could buy a big 50 pound tank and basically have carbonated water forever. However, my needs were more modest so I chose a five pound cylinder. This size of cylinder is easy to transport (just under two feet long) while still holding much more gas than a little paint gun canister. Screw the regulator on to the cylinder. You can use a wrench to tighten it down but don't overdo it. Push the tubing on to the output of the regulator, and use one of the supplied c-clamps to tighten it down. Push the other end of the tubing on to the soda bottle adaptor, and use a c-clamp to tighten it down. I mounted my setup on a post in my garage, using some plumbing clamps. It's probably best to do something similar so you don't accidentally knock it over. 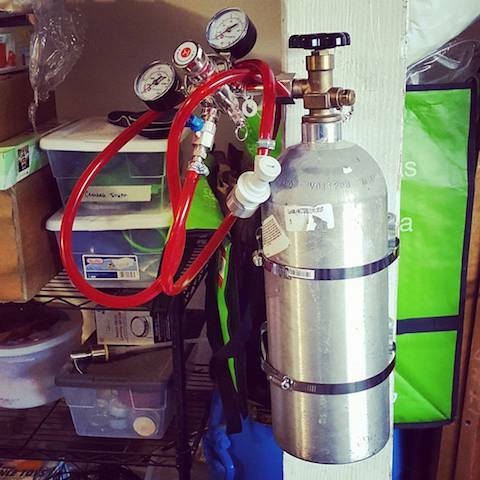 Once you have everything connected, you need to set the output pressure on the regulator (that's why it's called a regulator - it regulates the high pressure of the gas canister down to a lower more usable pressure). You want the output pressure of the regulator to be around 50psi. This is adjusted with a ring or screw on the front of the regulator. Just turn it clockwise until the output pressure gauge shows 40 or 50psi. It's not an exact process, just turn the regulator until you have around the right ooutput pressure. There's an on/off valve on the output end of the regulator (where the tubing connects). Leave it turned sideways (off) while you adjust the output pressure. No need to waste co2. Adjustment and operation of the Kegerator-brand pressure regulator is terrible, and that's why I recommend finding a different pressure regulator. I found several times that even though the output was set to 50psi on the guage, the pressure valve on the side of the regulator would randomly start venting, wasting gas. Other times, even after I had not adjusted the regulator at all it would suddenly jump up to 75psi or drop down to 30. The Kegerator brand regulator may be the cheapest you can get, but there's a reason for that. I recommend paying extra money for a better piece of equipment. Filling a bottle is pretty straightforward, although there is a bit of technique. First, note that it's best to fill pre-chilled bottles of water, as they will hold more gas in solution. I usually put my bottles of water in the fridge overnight to chill. Second, you need to leave lots of headroom in the bottle so that the co2 can get in there. I usually leave several inches of space at the top of a two liter plastic bottle. Once you have the bottle connected, open both the regulator output valve and the valve on top of the tank. You will hear co2 start to flow. I find the best technique for filling a bottle is to hold it upright and shake it up and down fairly vigorously. As you do this, you will hear gas continue to flow in to the bottle, and the flow rate will increase each time you agitate the bottle. There's no precise amount of time you need to let the gas flow. In general, I continue to shake the bottle and allow it to fill for twenty to thirty seconds. This results in well-carbonated water. Once you are done filling the bottle, turn off both the tank valve and the regulator valve before unscrewing the bottle from the adaptor, to minimize wasted gas. The bottle will bubble over a bit, but it shouldn't be too violent. Note that I've pretty much only ever carbonated bottles of water, but in theory you can carbonate any reasonably runny liquid. You should experiment and tell me how it goes! What about carbonated whiskey?